Supercharge your Windows® experience with WindowFX™! Revolutionize your operating system with WindowFX. Utilize an unprecedented number of special effects for your windows and maximize your computing. 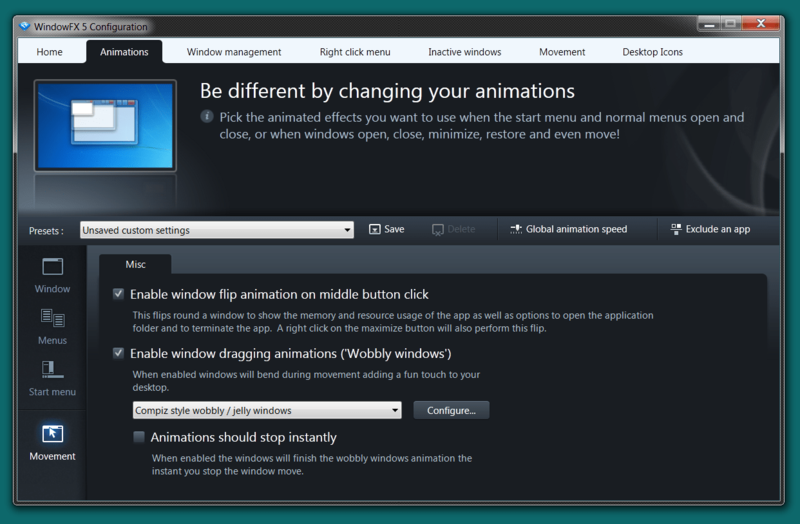 Pick the animated effects you want to use when the start menu and normal menus open and close, or when windows open, close, minimize, restore and even move! WindowFX™ provides a number of time-saving window management features such as screen border resizing, window border maximizing, and window shake. Set "always on top" state, transparency and pick from predefined window sizes all from the window right click menu. Make the active window stand out, make inactive windows fade away, and automatically minimize background windows. Add "window flick" actions to movements, fade windows when moving, and add momentum so you can throw windows around your monitors. Reduce desktop clutter by hiding your desktop icons until you really need them, and get the full enjoyment of your desktop wallpaper.